When I first saw the cover for Cherry Bombe, The Cookbook, my first thought was “is this just a collection of cherry recipes?” A quick look proved me very, very wrong. Cherry Bombe celebrates women and food through our biannual magazine, the weekly Radio Cherry Bombe podcast, and our Jubilee conference. What rocks our world? Sharing the stories of everyone from industry icons to notable newcomers, encouraging creativity in the kitchen, and bringing the Bombesquad together whenever possible. Our first cookbook, featuring 100+ recipes from 100+ of the most inspiring women around, will be out this October from Clarkson Potter. So then… what is in this book? That’s the real question, isn’t it? I’m happy to report that I literally got the last review copy available from Blogging for Books to satisfy my curiosity and yours. The chapters are standard: Mains, Soups and Salads, Sides, Apps/Snacks/Sips, Cookies/Cakes/Pies, and Sweet Treats. Pink Spaghetti with Beet and Ricotta Sauce – I like beets but rarely cook them. Plus, this recipes has only 10 ingredients, two of which are salt and boiling water. It seems very approachable. Filipino Vinegar Chicken – What Filipino food I have, has always been pretty delicious. I would love to become more familiar with it. Shroomy Cheeseburgers with Maple Thyme Caramelized Onions – Just the title alone sounds amazing. While more complicated than the burgers I normally make, nothing immediately looks scary or impossible. Chicken Meatballs in Roasted Lemon Broth – The broth is nothing that readily makes sense to me. Broth ingredients are lemons, olive oil, shallot, bay leaves, cinnamon stick, chicken broth, dried mint, potatoes, cipollini onions, and spinach. I can’t imagine how this tastes, so I feel the need to make it. Roasted Asparagus and Scallions with Burrata – I recently had dinner at The Amsterdam in Rhinebeck, NY. My plate was fish with grilled bok choy, grilled scallions, and green goddess dressing. I was surprised at how mild the grilled scallions were. I imagine that roasted scallions will the same, and I bet it’s delicious with asparagus and burrata. Best Friend Cheesecake – Overall, it’s a straightforward and basic cheesecake recipe. That’s not a bad thing. Dad’s Perfect Sweet Potato Pie – Submitted by Joy Wilson, aka Joy the Baker. Also, sweet potato pie will always be my favorite pie ever. Irish Soda Bread – Interestingly, this falls into the Sweet Treats chapter. I think it appeals to me just because this recipe is baked in a 9×5 pan. I like baking in my loaf pan. I bake a lot of recipes in it that were meant to be muffins and such. Other comments about the physical book, and not the content: I suspect that the cover will be prone to wear and tear. I haven’t even owned this book for 24 hours yet, but the corners of the front look like they’ve seen better days. Every recipe has an accompanying photo. The general style of the photography reminds me of current day Bon Appetite – a bit more HDR looking, a bit too brightly lit. It’s not my favorite style, but I know it appeals to others. 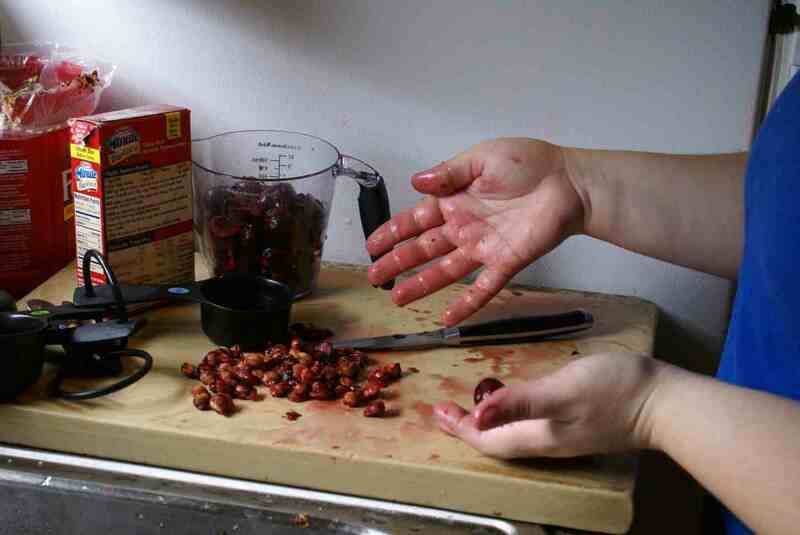 As I ponder which cookbooks to cull from my collection, I feel confident that Cherry Bombe will stay in it. There’s just too many recipes I legitimately want to try. For the first time, I have made a pie completely from scratch. It was a spiced plum pie with a butter pie crust. It wasn’t pretty, but the dough came together and I kept it in the fridge overnight. This kept it nice and cold, but, unfortunately, made it very painful to roll out into a 13″ circle. Yes, painful. I’ve had wrist problems in my left hand recently, so this was not one of my more stellar moments. I put my pie crust in the pie pan, filled it with the plums and spices and sugar, and popped it into the oven that had been preheating for a very, very long time. I accidently tented my pie with foil from the get-go. I didn’t read the instructions well enough. After 20 minutes, I finally realized to take the foil tent off. The foil stayed off for about 30 minutes, before I finally put it back. All the while, it smelled lovely. And the baking finished at around 2am. Fifteen hours later, the pie was finally cut into (it was one of three pies for our 4th of July BBQ) and lasted about ten minutes before it was whittled down to just one small slice. The crust was good. Asano-mama said it was flakier than the crust on her pies, and a friend of mine who really had not been subjected to my food experiments yet was also suitably pleased with the crust. 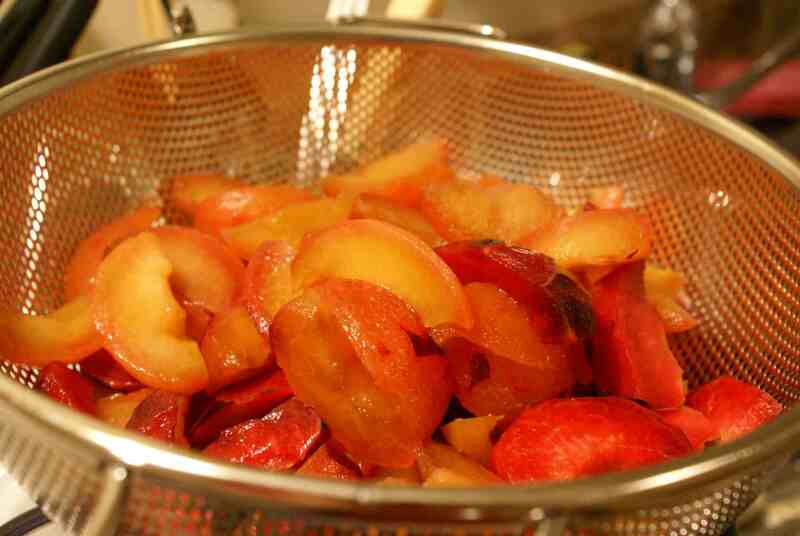 The plums were more tart than I expected them to be. (Thank goodness for vanilla ice cream and all things a la mode.) But I was fairly happy with my pie. I think I might like to mix the plums with something else like apples or pears or strawberries next time – something to balance the tartness. 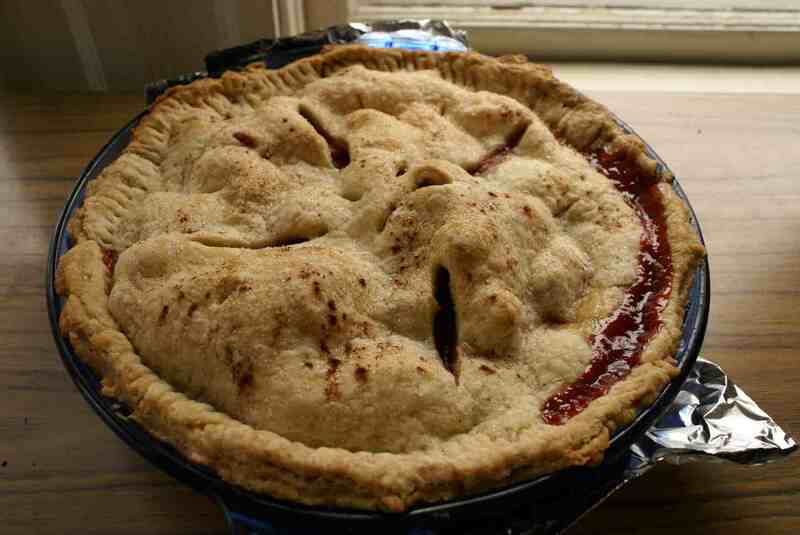 The same friend who was pleased with the crust commented that my plum pie reminded him of rhubarb. I can see that. The verdict? It was a good way to spend some time and the results were better than good. I made a joke last month about making a pie on 3/14. I’m a nerd, I know.